Recently we’ve been looking at the history of sustainability practices at Michigan State University. Part of being ‘green’ is reducing one’s food miles. This is the distance of the production to the distance of consumption. Food transported long distances or across continents burns up fossil fuels and contributes to global warming. In recent years, prevention of this has led to increased emphasis on growing and eating local foods. Michigan State University is currently trying to be more local, but also has a long history of sourcing food from the area and producing our own. One way of examining where our food came from in the past is by looking at the containers that they came in. 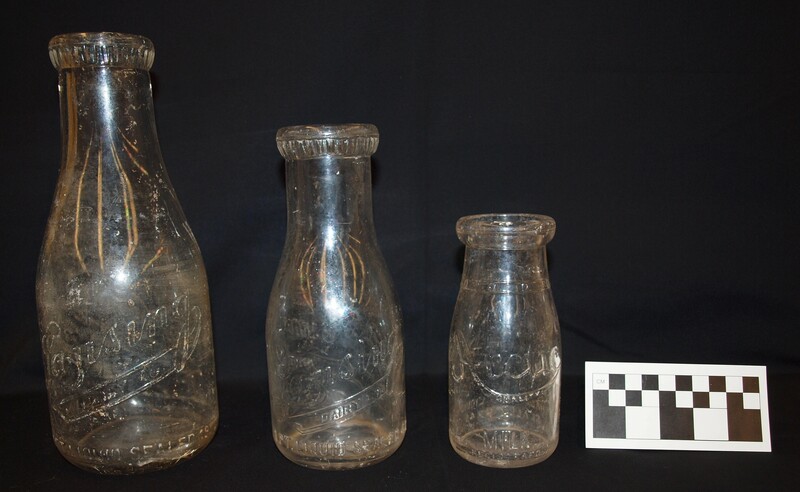 We have a number of milk bottles from the Brody-Emmons surveys that have occurred. The site dates to the early 20th century, when there was increasing long distance travel due to the introduction of automobiles. Milk bottles can show us where students and the community were getting their dairy supply, and how far the dairy traveled to reach us.There are three types of milk bottles that we have found: Arctic Dairy, Lansing Dairy, and MSC Creamery. Arctic Dairy was founded in 1908 by Alfred Foster Stephens. The first plants were opened in Detroit, but they had factories later in Grand Ledge, Grand Rapids, and Hastings. In 1922, the company had forty-five trucks and thirty five wagons, and employed an average of one hundred and fifty men. In the 1930’s the company was bought by Detroit Creamery, but the name was retained. The company still exists today, but it only produces ice cream. 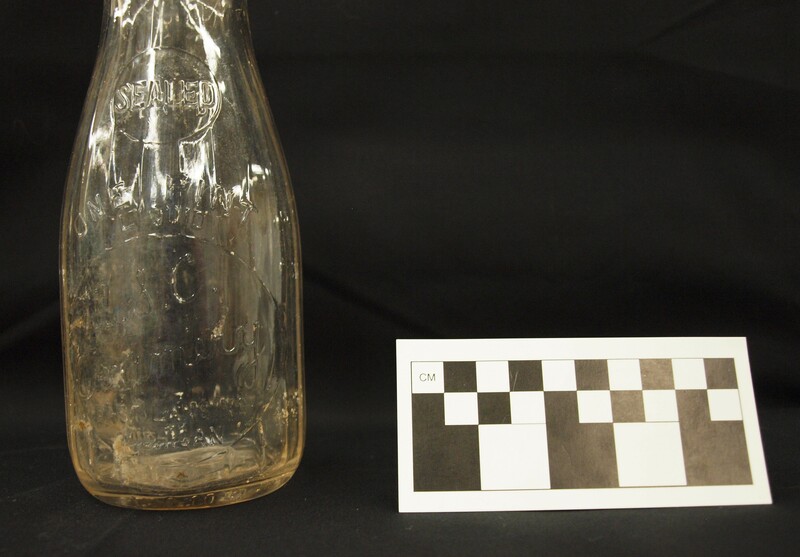 Campus Archaeology recovered a number of these bottles in different sizes, suggesting that Arctic Dairy had a fair amont of popularity in the area. Lansing Dairy Company was started in the 1920’s as a co-operative organization for area farmers. From a a Milk Dealer’s journal printed in 1922, we see that the group’s goal is to produce primarily fluid milk, using the leftovers for by-products. When it was started the company was lauded for using the most up to date technology for sanitation and production. Finally, we have a number of bottles from the Michigan State College Creamery. Due to the campus beginning as an agricultural college, it isn’t surprising that there is a rich history of dairy production here. The first dairy classes began in 1895 at MSU. In 1914 a new dairy building for study and research was opened on campus, and in 1929 the new dairy was erected as part of a generous donation by the Kellogg family. It is unclear when milk started being delivered or when it stopped, but we have evidence of the bottles from the 1920’s East Lansing landfill and bottle caps from their milk bottles dating to the 1950’s. The MSC creamery exists today, but as the MSU Dairy Store where you can buy fresh MSU milk products, delicious ice cream, and on Mondays get the best lunch deal in town! The fact that most of our milk bottles come from a limited region shows that people were buying local, but not exclusively East Lansing or Lansing products. Increasing use of trucks allowed people to buy milk from Detroit or Grand Rapids instead of the relying on the two closest dairy producers. End of the Summer Wrap Up! Welcome Back to MSU’s Historic Campus! I came upon your website when I was attempting to find more on Arctic Dairy, I unearthed a quart bottle in my back yard years ago and I have not found much about the bottle (history,value, etc. ), do you have a value or any other information on this dairy? During repair work on our parking lot near the Trowbridge entrance to MSU we found a half pint MSC Creamery bottle like the those passed out in grade schools 50 years ago. This apparently was from a local country dumpsite which was paved over at least 55 years ago. Since MSC became MSU 1n 1955 I assume it predates the change. In any case the milk did not travel far. The diary in Lansing was spelled Artic Diary, spelled the way it used to be pronounced. I know it should be Arctic. Today most people pronounce the first ‘c’, but it used to be silent.